This ride was long in planning and high in anticipation. Chelsea & Fulham H.O.G. have visited Normandy before, indeed several times, as it has the advantage of relative closeness and exceptional appeal. Seafood, cheese, Calvados, picturesque roads, fascinating history, welcoming people, what’s not to like? As with any ride that Chapter Director John Warr is leading, nothing (apart from the weather) is left to chance. The route to and from Normandy from Calais doesn’t allow for much variety as we need to use motorways due to the distance required and time available. However I was privileged to be awarded the Saturday ride-out, so that’s where my attention lay. Normandy has several key aspects that I wished to include; firstly the riding routes had to have a nice mixture of roads, from modern dual carriageway to back-roads (apologies for the golf course and the farm yard, these were perhaps a little too ‘back-road’). Secondly there had to be something to look at, especially for pillion riders, so I chose approach roads to towns where there were landmarks and sights to view - the first glimpse of the sea heading north from Creully, the towers of Bayeux and Caen cathedrals, the start of the ‘bocage’ as we headed inland from Port-en-Bessin. Finally it was important that the immense legacy from the WW2 invasion wasn’t overlooked, as this has reforged France from its disaster in 1940. Modern, vibrant, cosmopolitan France is an end-result of the long fight back from the despairing depths of the Vichy republic, and the 6th June 1944 marked a key turning point where the French people could start to believe again that they had a future rather than a past. So not much to achieve then! Friday we rendezvoused at Folkestone for an early train. Rob Warr was unfortunately held up on the A3, but Dietmar Kohl managed to find my house extremely early so no risk of me being late! Only wrinkle on the downward leg was the lack of a petrol station at junction 11, throwing refuelling plans briefly out of kilter. Variations on breakfast then took place until they called us for the train. I love the tunnel as there are no travel sickness issues and it’s really quick and easy to get on and off, so without further ado we were off into France. Rob caught us up not long after leaving the train, showing the advantage of travelling alone to make up time. The A16 took us south down the Pas de Calais before turning West to find the awesome Pont de Normandie. Gosh it was windy. Coming from the North you cross the Pont de Tancarville first as a sort of taster for the main course, which is stunning... a total length of over 2km, and the pylons holding it all up are 214 metres tall. And did I mention that it was windy? It felt like you were driving up the roof of a house in a 50km cross wind. Adrenalin rush contained, we got off the motorway and made our way into Trouville for a coffee stop. Trouville is a real tourist trap which was originally a small fishing village and still has a working fleet. Either way we had an excellent cup of coffee. Continuing on towards our destination of Caen, the weather deteriorated sharply, with already heavy rain turning heavier and interspersed with heavy hail showers. The traffic on the motorway was getting heavier as the Friday rush hour got going, and there were a string of accidents slowing us further. Fortunately all reached the hotel unscathed, despite the efforts of some apparently suicidal French truck drivers. Once we had gained access to the underground garage of the hotel the bar beckoned, and as we were free to make our own choices of where to eat, the party soon dispersed into town. Saturday morning dawned grey, cold and very wet. A quick breakfast discussion with JW and other road captains led to the decision to keep calm and carry on so we left on time to do the route as planned. This turned out to be a very good decision as throughout the course of a full day we did in fact achieve everything and more. This did however rely upon the riding skills of the chapter as there were difficult conditions and some very twisty and narrow roads. The outgoing route from Caen was effectively due north through the suburbs until we reached the edge of the town. There are very many traffic lights on this road. We then followed the road north through Creully (which was liberated on D-Day by the 4th/7th Royal Dragoon Guards, the memorial was at the road-side) to the coast at Arromanches les Bains. The view of the sea from the plateau was breathtaking. Just east of Arromanches on the cliff-top is a 360° cinema, where we went for a viewing of the film created by the local tourist board and chamber of commerce; this shows archive footage of the D-Day landings interspersed with shots showing the extent of the rebuilding required afterwards. Some towns and many villages were razed to the ground in the fighting - for example Pont l’Évêque and St Lô effectively ceased to exist, and much of Caen ended up about three feet high. Such was the price of freedom. 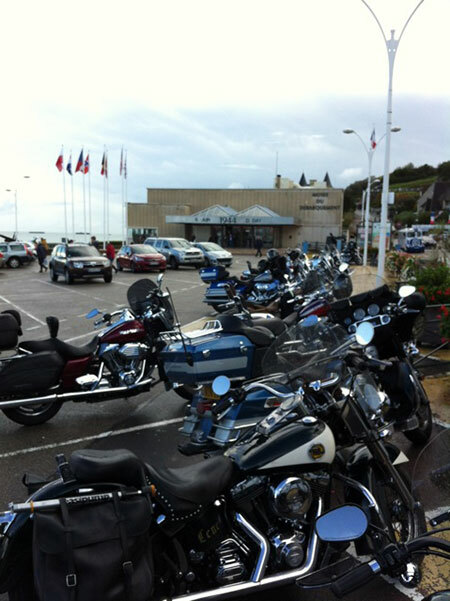 A popular request for a coffee stop was met by a half-hour sojourn in Arromanches itself. There is lots to look around in the town and the remnants of the Mulberry harbour still squat off-shore. Next, it was along the D514 to Omaha Beach. 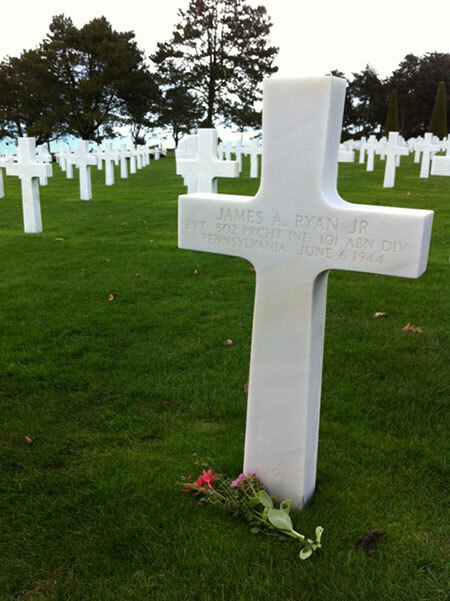 The beach itself is below the Normandy American Cemetery and Memorial, a stunningly well kept final resting place for over 9,000 American servicemen and women who fell in the battle for Normandy. Amongst them is one of the Ryan brothers (they saved the last one) and General Theodore Roosevelt, a son of the president. A veteran of the First World War, he landed on D-Day and, having survived the immediate fighting, died of a heart attack in July 1944. Standing at the top of one of the ‘draws’ or gullies which were heavily fortified by the German defenders, you realise how utterly without cover the American soldiers were as they exited their landing craft. The only way off the beach was to climb one of the gullies in the teeth of the machine guns. Back along the D514, then a bit of back-roading got us to the D6, the Route de Bayeux. This was the road followed on 7th June when Allied forces liberated Bayeux intact. The drive in from the north revealed the twin spires of the magnificent cathedral, apparently inspired by Chartres. Having an intact town meant that there was fortunately somewhere to house and help the thousands of displaced refugees from the fighting. It also meant that the treasures of the town were undamaged, so that’s where we went next, to see the ‘bit of carpet’. Terry Ferguson certainly has a fine sense of the aesthetic. It is also known as the Bayeux Tapestry. By now the sun was out and the roads dry, so after some R&R we returned to Caen. Initially we drove along the old Roman road which parallels the N13, the modern dual carriageway, but after 5 miles or so the old road peters out so it was a short hop along the new back into Caen. It was a good opportunity to clean plugs or blow out carburettor jets or whatever the excuse was for some less restrained enthusiasm. 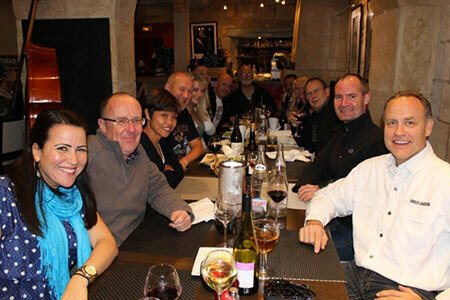 Rendezvous for the evening festivities was 7pm in the hotel bar, then en masse into the old town for a Chapter feast (were you menu A or menu B?) Fortunately the restaurant had a piano so the Papases entertained magnificently with a selection of hits old and new. Terry Ferguson then rounded the evening off with a bravura performance of “Running Bear”. By that stage the wine and beer had been flowing more than adequately, so whereas some people decided that enough was enough, other people clearly had the taste. It was obvious at breakfast on Sunday who was in which camp. In vino veritas! Sunday’s ride back was mostly in good weather, but it had got quite a bit colder so those with heated clothing certainly enjoyed it more. A windscreen also helps to make the riding more enjoyable. Due to the ban on trucks over 7.5 tonnes on Sundays (apart from those carrying perishable goods) the motorways were virtually empty, and hence much less stressful to use. Accordingly good time could be made and a steady 80mph maintained. We still missed the train, but that was as much an issue with slow lunch service in Fécamp and the inordinate amount of time it seemed to take 25 bikes to fill up with petrol or get through a toll booth. Those who couldn’t get squeezed onto the next train were last seen heading back to the terminal building for food and shopping. Quel dommage! Stats for the weekend - 732 miles at an average speed of 50mph, 14 hours and 36 minutes riding time. No equipment failures, but an awful lot of mud. Today I mostly washed my bike. Thanks to John & Colin for leading, Mick Newstead and Les Channing for last man duties. Photographs kindly supplied by Manuela Ferguson and John Warr for which many thanks.